As a Repeat customer I highly recommend Andy and crew!!!! This fire pit is our take on the Mid Century Modern Craze. Thanks to one of our customers for inspiring us to make one. It’s now a standard fire pit in our product line. Tough as nails. Good for small groups (2-5 people), easily throw this fire pit in the truck for camping or tailgating or just impress your friends with it’s cool style. This fire pit sits 15″ off the ground and has a 1/2″ drain hole for water. Everywhere we look nowadays we’re seeing more and more of the Mid-century modern style popping back up. So, here we have our 30″ Elliptical Mid Century Modern fire pit. Inspired by the simple and clean lines you find so prevalent in the MCM design. This 30″ Mid-Century Modern pit has a simple look to it with it’s shallow bowl and hand forged hairpin legs it speaks MCM on your back porch. The 1/4″ thick all American made steel bowl is super solid. The handles from this fire pit are also simple and clean, coming from re-purposed truck springs and welded on the inside they are not only tough, but hidden to give you that clean MCM feel. At 80lbs it’s still an easy fire pit to manage and take to your buddies house for a party, yet just like all our fire pits it will never fall apart. Just don’t forget to make them bring it back the next day once it cools with a good thank you six pack. 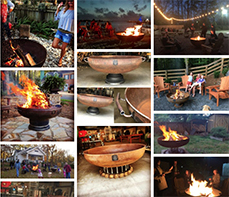 Being one of our 30″ fire pits it will easily entertain 2-5 folks comfortably. Step up to the next size, our 36″ Mid-Century Modern fire pit, if you tend to entertain more than that or go for it and get the 42″ Mid-Century Modern fire pit and make a grand statement. This fire pit also comes with one of our 46″ standard fire pokers yet if you think you need fancier check out our decorative fire pokers and other tools.